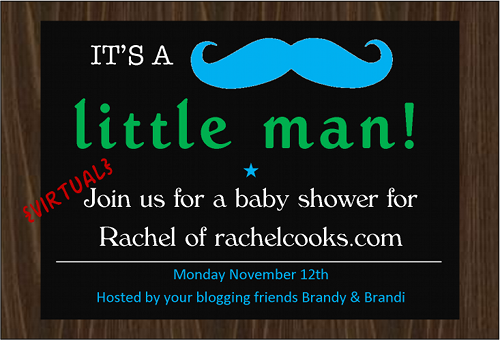 My friend Rachel from Rachel Cooks is having a baby soon, and what could be better than a virtual baby shower? Well, how about a virtual baby shower with actual food? 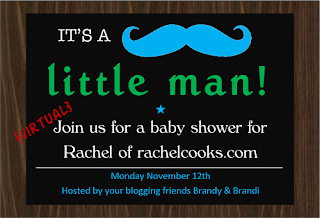 I spent quite a bit of time trying to thing of something to "bring" to a virtual baby shower. Appetizers? Snacks? Fruity drinks? I almost posted a cocktail, but that's not exactly fair to the mom-to-be. Then, a new cookbook arrived. It usually takes me quite a while to decide what recipe to make first when I get a new cookbook, but this time, it was easy. A coffee cake recipe looked absolutely perfect. Okay, a lot of things looked really good, but I had all the ingredients for the coffee cake, and I thought it would be a great thing to bring to the hospital for the nurses. 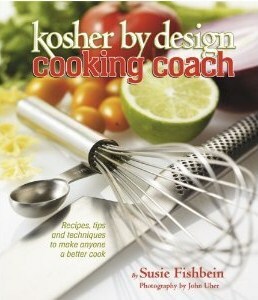 The book is Kosher by Design Cooking Coach by Susie Fishbein, and it's one of eight books in the Kosher by Design series. 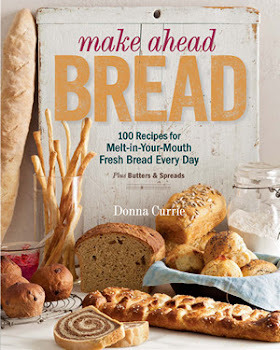 This one isn't just a cookbook, it talks about kitchen equipment, technique, and even how to plan for leftovers for the recipes. So, for example, you can make stuffed cabbage one day and use the leftovers for soup the next day. There are lots of recipes. Lots and lots of them, from bulgogi to brioche and from Cajun quinoa to Yemenite beef soup. I'm looking forward to trying more of them, but first I had to make the coffee cake. This coffee cake has a layer of graham cracker walnut streusel running through the middle, and it's got a crumb topping. The recipe calls for baking in a tube pan ... but of all the things I have, that's not one of them. I considered making the cake in a bundt pan, since it's the same shape. But then the crumb topping would be on the bottom, and that just seemed wrong. So I decided to bake the cake in a 9x13 pan instead. It worked perfectly. I also made a little goof on the topping - you're supposed to mix the sugar with the warm butter first, then add the flour. I mixed the sugar and flour, then added butter. Oops! But it still worked okay - probably better if I did it right. The recipe calls for using dairy products (butter and milk) or option for non-dairy (margarine or nondairy whipped topping). I opted for the dairy products. If I was going to an actual baby shower, I'd be happy to see this coffee cake among the offerings. I hope Rachel (virtually) likes it as much as I did when I had it with my (actual) coffee this morning. Preheat the oven to 350 degrees and grease a 10-inch tube pan with a removable bottom. In a small bowl, combine the ingredients for the streusel topping. Stir well and set aside. For the cake, mix the flour, baking powder and salt together in a medium bowl, and set aside. In the bowl of a stand mixer fitted with the paddle attachment, beat the butter, sugar, and oil until it's creamy. Add the eggs and mix until smooth. Lower the speed and add the flour mixture. Raise the speed and beat until you have a smooth batter, scraping the sides of the bowl as needed. Lower the speed and beat in the milk, vanilla extract, and almond extract. Spread half of the cake batter in the prepared pan and smooth out the surface. Add the walnut streusel evenly over the batter. Add the rest of the batter, and smooth the top. Break the crumb topping into large chunks - 1/2 to 3/4 inch pieces - and sprinkle these chunky bits over the batter. Bake for 45 minutes at 350 degrees, until a toothpick inserted in the center of the cake comes out clean, or with moist crumbs. Cool the cake completely before cutting. Note: I baked this in a 9x13 pan and it took about the same time to bake. Want some more baby shower goodies? Check out these wonderful blogs for more great recipes.